07-Jan-2005 -- This is the second confluence point in Qaṭar which we visited. The plan for the day was to visit the Oryx reserve, the al-Nu`mān oasis, and then end up at the ruins of Zubara. The idea was to try to get as close as possible to the actual point, which unfortunately is offshore, just north of a Navy base. We left Dawḥa around 09:30 heading for Dukhān. The Oryx reserve is off the main road on the western coast of the peninsula. We arrived there after a bone-rattling journey and one flat tyre. After this we had some fun spinning the cars 360 degrees on the mudflats on our way to the oasis. The oasis is the only location in Qaṭar with a large amount of not man-planted acacia trees. Continuing north, we turned towards the ruins of Zubara, the town was destroyed with the Murayr fort in 1878, with some parts of the town being restored by a Danish archaeological group. We reached the closest onshore point (25°59.308'N 51°01.208'E) to the Confluence, which however is still 2.39 km further offshore. The presence of a Navy base south of the confluence points makes putting a boat in the water somewhat risky. My Arabic is not sufficient to explain the concept of confluence points. We settled, after all this hardship, for a BBQ near the restored perimeter wall of the Zubara town. 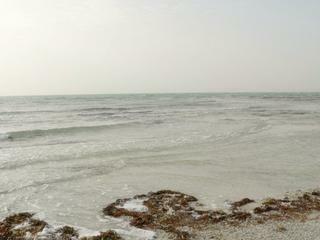 In the waters of the Gulf, 1.5 km from a small island.